So you are on 29th Street walking from Goood Frickin’ Chicken to Rock Bar when you hear a strange sound. You’d swear it’s one of the historic streetcars along Church Street and the Embarcadero, but… that can’t be right. Suddenly @karlthefog lifts and tracks reemerge on 29th! The number 9 streetcar reappears! The streetcar is hurtling down 29th St, but no one is on board. The ghostly 9 rips past the Front Porch and the 3300 Club. It’s going way to fast to make the turn onto Mission Street. It jumps the tracks and plows into Pizzahacker! The car with the injured reached Mission street… but on the other track, car 1664 [was] gathering speed rapidly as its 26 tons of smoothly turning wheels came flying down the grade. Quickly the turn was made from Twenty-ninth street into Mission. Warning shouts were given and the crowd which was strolling in Mission street gave way to the green electric vehicle which came racing down the tracks. With a bound the wheels of the runaway struck the flanges of the rails at the turn. The car swerved on the pavement. The trolley flew off. The car struck the curb and half turned, but could not he stopped and sidled over the sidewalk and crashed into the glass fronts of the stores. The people In the store had heard the shouts in the streets and were turning to the door when they saw the car coming upon them with the almost animated ferocity of a dragon. They fled toward the rear of the store, but the car was too quick. Through the brittle glass and the thin wood frame the mad car smashed its way. 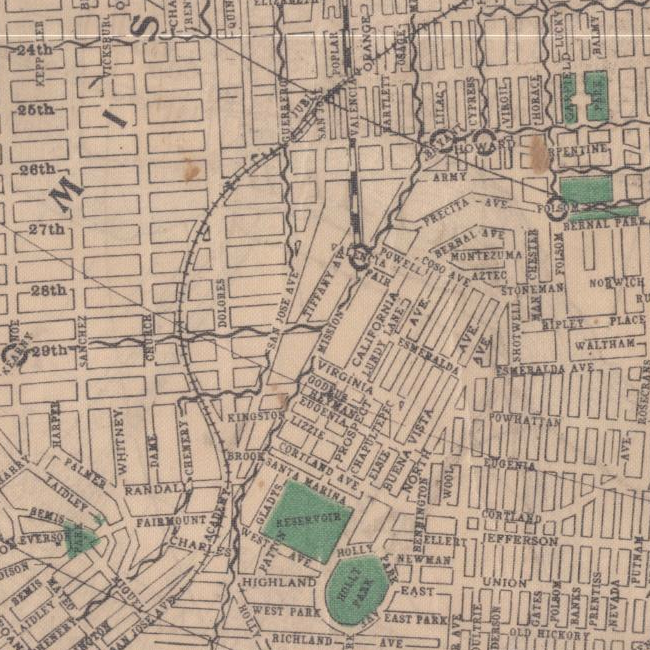 Here’s the 1900 Sanborn Maps site of the crash (and where Pizzahacker is today). Here’s a GIF of the change from 1886 to 1950. The candy shop became a bank, probably in the 1930s. 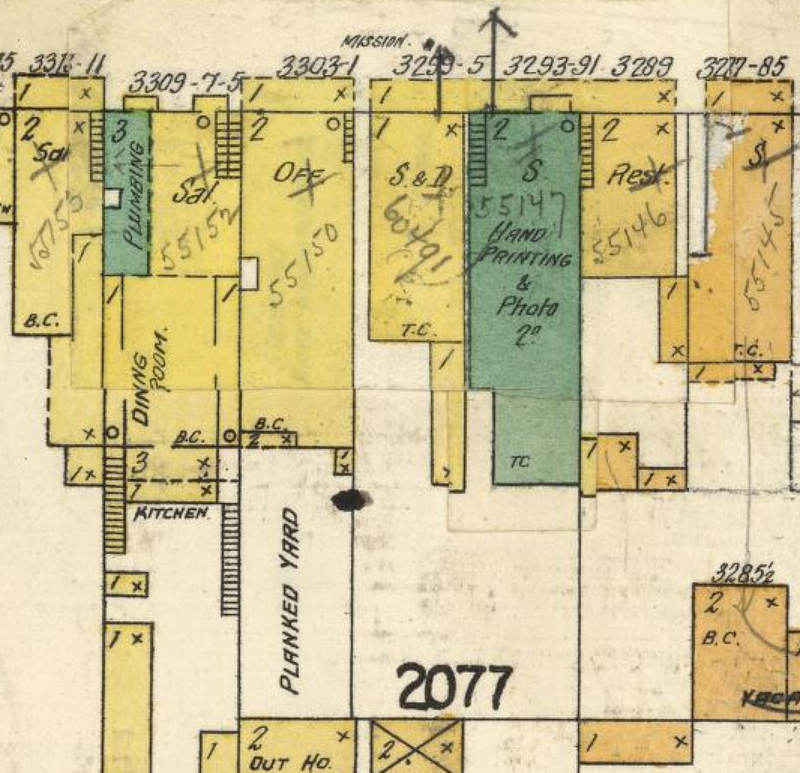 And here’s the color Sanborn map from 1905. Looks like the kindergarten may have shut down by that time. 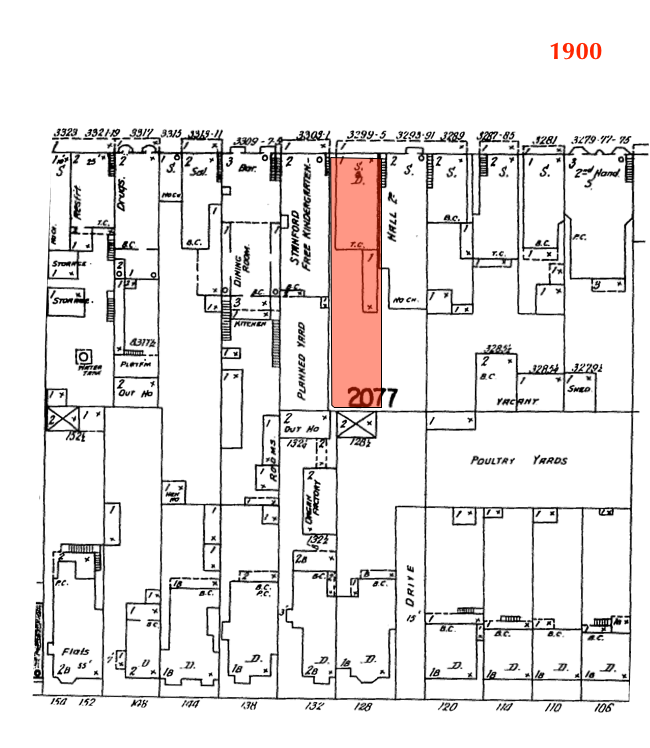 I’m not entirely sure if the lines were numbered in 1909 — those maps above are from the 1920s and 1940s. This one is from 1905, and seems to show destination names instead of numbers. Here’s an ad from 1908 showing the Mission Toggery, “The Busy Store”. And the Lyceum! And Mr. McTigue! Anyway, the crash led to no end of lawsuits. @Pizzahacker is already looking to get in on it. Nice! 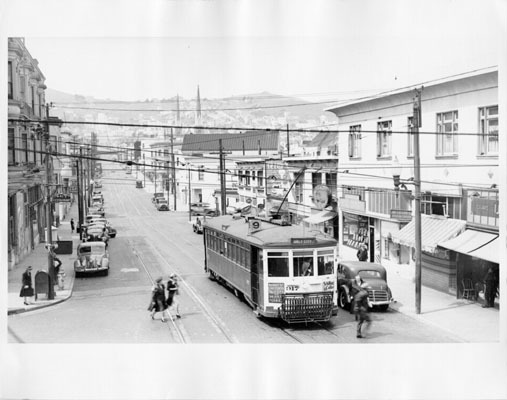 Also great to see another post on the history of La Lengua! Have you ever looked into the history of the 3300 Club? The walls have tons of great photos from the family and friends of the 3300 going back at least as far as the 30s or 40s.